LCD Writing Tablet with the latest LCD technology with brighter and wider angle of display. It keeps the hands clean without any dust, environmentally friendly, and you can clear the screen just by pressing the delete button; or if you need to temporarily save the contents on the screen, you can lock the delete button and they will not be cleared. Make sure that the tablet can be used normally, and please do not draw on the LCD area with something sharp. When you are not using it, turn it off with the lock button to protect the battery for longer use. Locking & Saving: No worry about images or files lost as you can simply lock the delete button; You can take a photo with your mobile phone or use a scanning APP to scan the comparison and drawing you want to save. Upgrade & Carry: When you use it for the first time use, the erase lock button is OFF. Unlock the button to switch it on. The upgraded screen is brighter, with larger and clearer display. The compact and lightweight appearance and weight makes it convenient to be put into the bag or briefcase. Environmentally Friendly Design & Maintenance: Up to 100,000 times of writing, by using it you can alomost save a big tree. Please use a towel to clean the screen often, and the writing will be more clear. 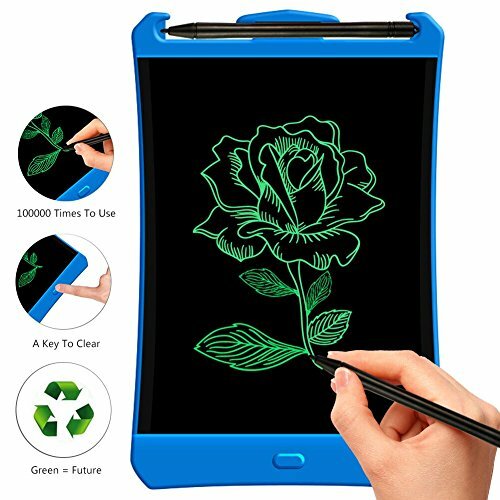 Wide Range of Use: The electronic LCD Writing Tablet can be used for children to draw and write drafts, or leave messages, notes or for business use, and can be attached to the refrigerator to record the shopping list at any time. Warranty & Gifts: One year limited warranty. If you have any questions, please feel free to contact us, and we will help you solve your problems promptly. A pen, a battery and a screwdriver will be offered as gifts along with the standard accessories. If you have any questions about this product by ZRXS, contact us by completing and submitting the form below. If you are looking for a specif part number, please include it with your message.